Over recent decades Christians have left Bethlehem in their thousands, and now are a minority in a city they once dominated. 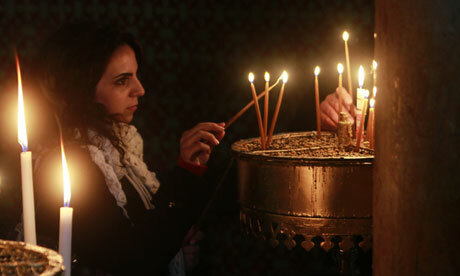 In 2008 Christians accounted for 28% of Bethlehem city’s population of about 25,000. The daily grind of living under occupation, with few opportunities, little hope and the violence of the Palestinian uprising 10 years ago are cited as the chief reasons for departure. But in the past few years the flood of emigrants has slowed. “We are here, and we will remain here, to help our new state become a reality,” says Nora Carmi of Kairos. Amid plastic bags snagged on gorse bushes, rusting hulks of cars in a breakers yard and a few shabby trailers, traces of a biblical landscape are still to be found on a hillside between the ancient cities of Jerusalem and Bethlehem. A couple of donkeys are tethered to a gnarled olive tree; nearby, sheep and goats bleat as they huddle against the chill December air. But this terrain will soon be covered in concrete after the authorisation last week of the construction of more than 2,600 homes in Givat Hamatos, the first new Israeli settlement to be built since 1997. It lies between two existing settlements: Gilo, home to 40,000 people, sits atop one hill; to its east, on another hill, stands Har Homa, whose population is around 20,000, with further expansion in the pipeline. Both are largely built on Bethlehem land. Givat Hamatos will form a strategic link between these twin towns, further impeding access between Bethlehem and the intended capital of Palestine, East Jerusalem, just six miles away. Israel considers these and other settlements across the Green Line to be legitimate suburbs of Jerusalem, which it claims as the unified, indivisible capital of the Jewish state. Prime minister Binyamin Netanyahu and official bodies have announced a spate of expansion plans in recent weeks. In the birthplace of Jesus, the impact of Israeli settlements and their growth has been devastating. In a Christmas message, the Palestinian president Mahmoud Abbas said Bethlehem was enduring a “choking reality”. Bethlehem is now surrounded by 22 settlements, including Nokdim, where the hardline former Israeli foreign minister Avigdor Lieberman lives, and Neve Daniel, home to public diplomacy minister Yuli Edelstein. The city is further hemmed in by the vast concrete and steel separation barrier, bypasses connecting settlements with Jerusalem and Tel Aviv, and Israeli military zones. With little room to expand, it is now more densely populated than Gaza, according to one Palestinian official. In Beit Sahour – the site on the eastern edge of Bethlehem where, according to Christian tradition, angels announced the birth of Jesus to shepherds in a field – William Sahouri is feeling the squeeze. Ten years ago, he moved into a housing project designated for young Christian families, which overlooks fields and hills where sheep once grazed. Now most of that land is on the other side of the separation barrier, inaccessible to Palestinians. Har Homa – which, like all settlements in East Jerusalem and the West Bank, is illegal under international law – is rapidly spreading down the hill. Cranes are at work on new apartment blocks; bulldozers are flattening land for new roads and buildings. In contrast, Sahouri’s home, along with others in the neighbourhood, is under an Israeli demolition order. It was issued in 2002 soon after the apartments were built without a permit, which is almost impossible to get in areas of the West Bank under full Israeli military control. After protests, the order was frozen but not lifted. Residents of Beit Sahour – whose 15,000 population is 80% Christian – say settlers have targeted another nearby spot. A former Israeli military base at Ush Ghurab is visited almost weekly by hardliners from settlements deep in the West Bank, who have repainted the abandoned buildings, planted trees and raised Israeli flags. The site is now known as Shdema to the settlers, who hold regular meetings and activities on the hilltop. Local Palestinians fear that the visitors will begin to sleep at the former base, then expand the site with additional caravans, followed by the provision of services – electricity, water, roads – and eventually permanent homes. This is a familiar pattern of how radical settlements, unauthorised by the Israeli state, take shape. On the other side of Bethlehem, another mainly Christian community is also facing a battle, this one against the planned route of the separation barrier. Under present proposals it will cut off 58 families, plus a monastery and convent, from their land. The monks and nuns of Cremisan have joined forces with residents to fight a legal battle over the route, which will be decided in the Israeli courts early next year. About two-thirds of the 400-mile West Bank barrier is complete; 85% of its route runs inside the West Bank, swallowing almost 8.5% of Palestinian land. In 2004, theInternational Court of Justice ruled it was illegal and that construction must stop. The wall already snakes around most of Bethlehem, its 8m-high concrete slabs casting a deep shadow, both literally and metaphorically. At the Christmas Tree restaurant, where there are almost no takers for the “Quick Lunches” on offer, business has slowed to a standstill since the wall blocked what was once the main Jerusalem-Bethlehem road. Scores of shops along the closed-off artery have shut down altogether. A few hundred metres along from the empty restaurant, a long steel-caged corridor leading through multiple turnstiles to a checkpoint is the main exit from the city for Palestinians wishing to go to Jerusalem. The Israel Defence Forces issues thousands of extra permits to Christian Palestinians to allow them to visit holy sites in Jerusalem over Christmas, but the lack of routine access has had a dire impact on businesses and employment rates.